We must know what we want, not just what we’re against. There is no overstating the fear and danger currently felt by activists. It is not melodramatic for people active in today’s social movements to prepare for massive government surveillance, along with court injunctions and fines aimed at bankrupting people and organizations. Protesters fear jail and repression for using their First Amendment rights. But what organizers and activists face as political actors will pale in comparison to the danger confronted by millions of people facing mass deportation, racist and religious attacks—with activists in these targeted groups facing the greatest risk. As Trump and his billionaire allies jostle one another in their bids to extract riches from our failed economic system, they will succeed only in making the system more unsustainable. While this situation has sent a shock of anxiety through the body politic, growing instability will allow us to take aim not just at unjust social policies but at faltering economic ones as well. 1) The rise of a racist nationalist right wing is a global phenomenon. Across the globe, the far right is growing. Viewing the rise of Trump as a distinctly American phenomenon leads to narrow analyses and technocratic solutions, i.e., “if just more people had voted.” Viewing the situation globally requires us to develop a deeper analysis of why the current economic/political system is failing around the globe and why the right has been more successful than the left at seizing on the growing discontent as evidenced by Brexit, the rise of the Marine Le Pen in France and the radical right throughout Europe. In Brazil, the right wing and their billionaire allies have used a “soft coup” to seize political and economic power. In Puerto Rico and in US cities like Detroit and Flint, “fiscal control boards” and emergency managers are being used to disenfranchise communities of color and put the very banks and financiers who bankrupted these communities in charge. Neoliberalism is failing for increasing numbers of people around the world, and its failure has created the conditions that has allowed the right wing to increase its power by targeting immigrants and people of color. Two seemingly contradictory things are happening at once: The right wing has captured the anger over its failures and the corporations, and the super-rich who benefited from neoliberalism are now offering themselves as the solution to the crisis they created. 2) Trumpism is a symptom, not the disease. We shouldn’t exclusively focus on Trump, as if all would be well if he disappeared and returned full-time to Trump Tower. His appointments, a mix of Wall Street hedge-fund and private-equity types like Wilbur Ross and Steven Mnuchin and billionaire hard-right privatizers Betsy DeVos, along with traditional Republicans like Elaine Chao, who serves on the Wells Fargo board, are all part of the complete corporate capture of government. The people and corporations that pulled the strings from behind the scenes are now officially in charge. Even more dangerous than his appointments are the “respectable” people and corporations, many of whom initially opposed Trump’s policies but are now lining up to feed at the trough of tax subsidies and profit from the unrestrained destruction of the environment, while eliminating the few remaining legal and civil rights and protections people have. 3) Whom are we really fighting? Unaccountable financial and corporate elites are driving inequality and undermining democracy. Call it what you want—financialization, neoliberalism, financialized capitalism, and regular old capitalism (and yes, we need better names) are all part of the word soup we use to try to explain the failure of the current economic order and the explosion in inequality that has led to fewer people controlling more of the globe’s wealth and political power. Understanding how billionaires and the financial elites are driving inequality and how they use race and structural racism to drive a wedge among the working class needs to be baked into the DNA of our analysis and actions. For example, billionaires peddle narratives about lazy black people mooching off the government in order to convince working-class white people to lower taxes and slash the public safety net, even though working-class white people are the primary beneficiaries of many social-welfare programs such as food stamps. As part of this, we need to demystify what is going on in the economy and develop tools that make the economy and how it works understandable. The right wing scapegoats people of color and immigrants in order to divide and weaken the working class. This is central to how it justifies slashing public spending, giving greater power to corporations, and getting working-class whites to support policies that harm them economically. For example, because banks successfully painted the foreclosure crisis as a predominantly racialized crisis caused by federal laws that made it easier for poor black and brown folks to get mortgages, it made it significantly harder to build public support for effective large-scale foreclosure-prevention programs, even though the majority of homeowners facing foreclosure were actually white. We need to incorporate anti-racism into our core analysis, and we must center it in our strategies, tactics, and messaging in our work with communities of color and working-class white communities. Organizing white workers into a multiracial anti-racist movement is both a challenge and a necessity. a strategy of caution and defense, focusing on limiting the damage that the Trump Administration can do, is destined to fail, as is any strategy operating under the illusion that we can work with Trump and his allies on issues like infrastructure. All defense needs to be married to offense. If we are defending immigrants from ICE and deportation, we must also target the private-prison investors who profit off immigrant-detention centers. When standing up to racist attacks on people of color, immigrants. and Muslims we must make Trump’s allies, who encourage and profit from these attacks, pay a personal and financial cost. We have the potential to drive fissures and division within the corporate world by holding them responsible for the most extreme views and actions of Trump. Let’s get started by mapping and exposing the billionaires and corporations who support and will profit off of the Trump regime. We should identify the specific billionaires, corporations, hedge funds, and other firms that have aligned themselves with Trump, and expose how they plan to profit from his policies and actions. By exposing who they are, broadcasting their vulnerabilities and the details of their business holdings and operations, we can develop a road map of where we need to organize and focus action. Organize the workers whose jobs they control: The hedge funds, private equity firms, and other corporate titans supporting Trump directly and indirectly employ millions of workers in factories, hotels, construction, retail, and other key sectors of the economy. Nothing will better expose the faux populism of these Trumpian billionaires than organizing the workers off whom they profit. Like Trump, they will viciously fight unionization and collective action. Nothing unites workers better than focusing on the people and entities that are responsible for declining standards of living. 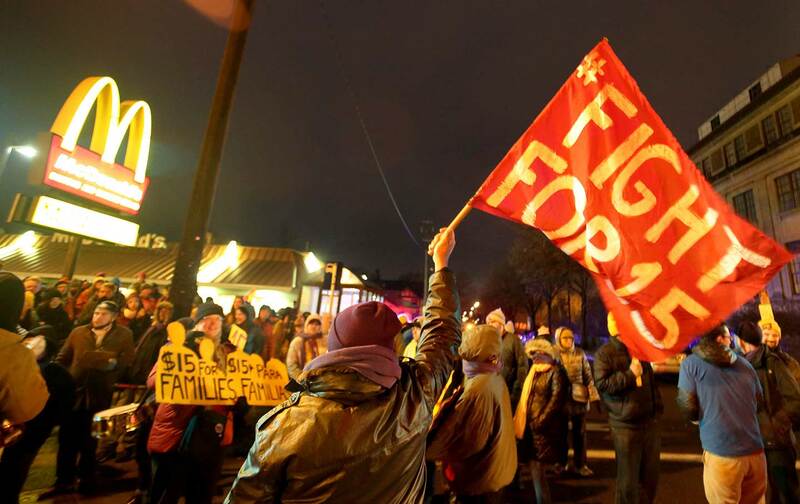 Organizing the workers whose jobs are controlled by the billionaire elites could take many forms, from traditional union organizing campaigns to militant minorities of workers taking action, to worker center–style campaigns. Organize and move our money: Thirty trillion dollars in worker’s capital—the deferred wages and taxes with which union-negotiated public and private pension plans are financed—are invested in hedge funds and private-equity firms. These entities charge outrageous fees, produce mediocre returns, shut down factories, outsource work, and use their profits to fund right-wing anti-worker politicians who want to eliminate pension plans. It is the right time to put pressure on pension funds—in states where unions remain strong—to divest from the radical right and invest in creating good jobs. The first step in a new trade policy that benefits workers would be to stop pension funds from investing in firms that move work abroad, devastating both urban and rural communities. Make them and their businesses toxic: When people rally and march to oppose right-wing racist attacks, support women’s right to choose, and defend the LGBTQ community, the businesses of Trump’s allies should be targets. Make them pay a political, personal, and economic price for their actions. We should be marching on, picketing, and sitting in at the offices and retail outlets of Trump’s allies. As increasing numbers of the “respectable” business community line up to support Trump, we need to make them pay a price by making their brands toxic. The work of OUR Walmart, the Immokalee Workers, and, most recently, the successful campaign to get Target to ban the box in Minnesota are all examples of public campaigns that won victories by making a brand or product toxic. Funding organizing and resistance while under legal assault:The corporate right wing will try in every possible way to eliminate the financial assets of the labor and progressive movement. In addition to “right to work” legislation, court injunctions limiting First Amendment activity and picketing, will be used to try to limit protest activity and use fines and litigation costs to attempt to bankrupt organizations. We can learn a lesson from Trump, who set up multiple business entities that eventually went into bankruptcy while shielding his actual assets. Labor and those that finance progressive activity need to provide unrestricted funding to nimble independent groups that can lead to large-scale disruption, civil disobedience, and engage in other activities too risky for groups with significant assets. By doing this we can insulate assets of the broader labor and progressive movement, while supporting the activity necessary to defend immigrants and others from attack. If an organization is truly independent, and the groups that prefund it exercise no control over its activities, then they are not liable for its actions. Corporate America has specialized in creating multiple entities to limit liability—we must do the same. When faced with crushing defeat, the progressive movement is incredibly adept at drawing the wrong lessons. We need to be clear about how we got here and about the role that structural racism and the neoliberal agenda championed by both parties played in contributing to the rise of Trumpism. Furthermore, our strategies and tactics must flow from that analysis. That means that, instead of seeking partnerships with major corporations or currying favor with billionaires (including the president-elect), we must directly and aggressively confront them and bring the crisis in our communities to their doorsteps. Donald Trump’s candidacy and election have unleashed a particular strain of white nationalism that seeks to make life in America unbearable for communities of color and immigrants. The challenge before us is to make life in Trump’s America unbearable for the newly enshrined and empowered billionaire class and their allies while offering a plan of action to win the country and world we want to create. Stephen LernerStephen Lerner is a fellow at Georgetown Universities Kalmanovitz Initiative for Labor and the Working Poor and architect of the Justice For Janitors campaign. Maurice WeeksMaurice Weeks is the Campaign Director of the ReFund America Project.